AD provides renewable long term, sustainable energy profits and jobs directly in the local community. The technology is ideally suited to the co-operative model and could provide 12% of Ireland’s energy requirement by 2020. 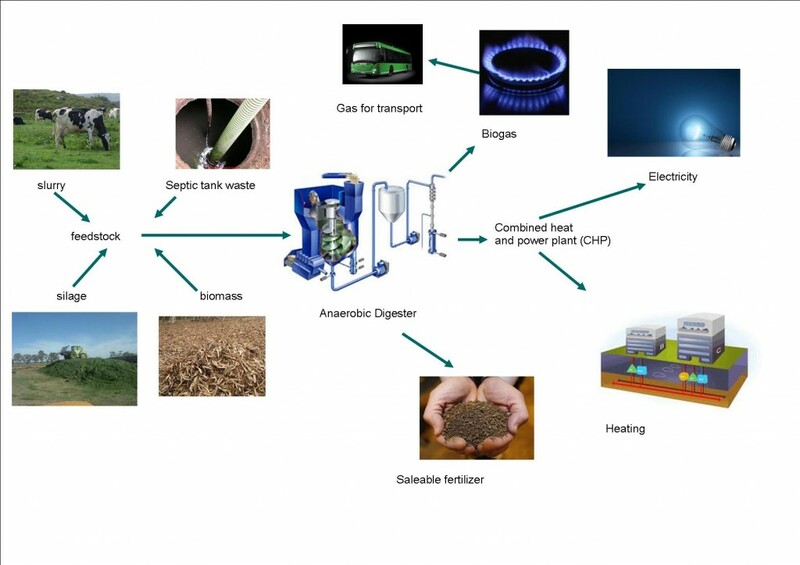 AD is a form of power generation using the breakdown of organic matter under controlled conditions. The organic matter can come from a variety of sources such as human excreta, manure, animal slurry, fruit and vegetable waste, slaughterhouse waste, meat packing waste, dairy factory waste, or from specifically grown plant matter (biomass) such as silage or maize stalks. The key to AD is that the material is broken down in the absence of air (hence ‘anaerobic’) and that the gas and heat produced by the process is used to both generate electricity and to produce heat which can be sold into a community heating project. The bi-product of the process is a high-grade saleable non-chemically produced fertilizer. A recent Oireachtas report in 20111 outlined the potential of this technology as a contributor to Ireland’s 2020 renewable power targets. It promotes the building of numerous 340kw AD’s throughout the country. With the correct ownership and management systems in place, each of these would provide a profit from energy sales of over €180,000 per anum. Additional income for local farmers of in excess of €150,000 would also be generated. These returns are possible under the existing renewables energy tariffs2 of 12c-15c per Kwh. A key to the commercial viability of Ad’s is in their place within their communities. A co-operative ethos, the involvement of local feedstock producers and the close integration of the local community in the project are all vital to its success. There are also the key issues of managing carbon offsets, selling the power to the grid and getting the technology mix right which all require specialist inputs. However, when done right, AD promises to provide a profitable solution to a considerable part of Ireland’s energy needs in an environmentally constructive way – one which locates jobs and commercial returns at the heart of the community. 2: This is the price paid to the renewable electricity producer by the market. There is also an upper cap of 50MW on the amount of renewable electricity eligible for this tariff. The exact tariff that applies depends on the type of generation system involved whether it’s over or under 500kw and whether its is a biomass CHP, AD-CHP, AD-Biogas, etc plant.